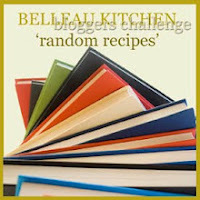 I am entering this in Dom's at http://belleaukitchen.blogspot.com.au/ Bloggers Challenge 'random recipes'. As I am a novice at this I hope I have included all the correct components. I took down this beautiful book Apples for Jam by Tessa Kiros, that I have had for a long time, and can you believe it I have never opened it, not even flicked through it, let alone cooked anything from it. The pages are still crisp and new albeit I could have owned it for more than 5 years! 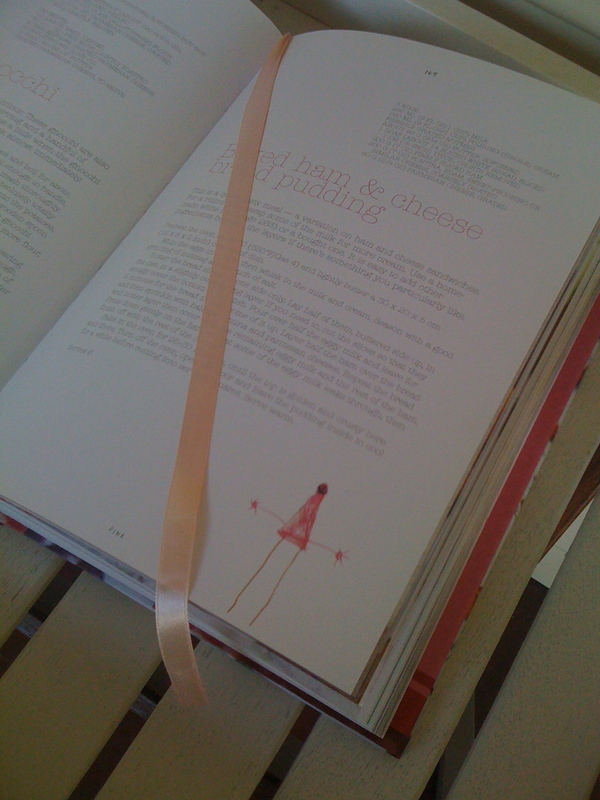 The pages opened automatically where the lovely pink ribbon marker slept inside - Baked Ham and Cheese Bread Pudding with the cute childlike drawing on the corner. That was the challenge for tonight! It was too hot really to have the oven on but I persevered. The first words said "this quick tasty meal" so that gave me encouragement. I scanned the ingredients and I had everything so this was looking good. I was very glad of the conversion to imperial measurements as I always struggle with pan sizes in metric. I think its called old age! 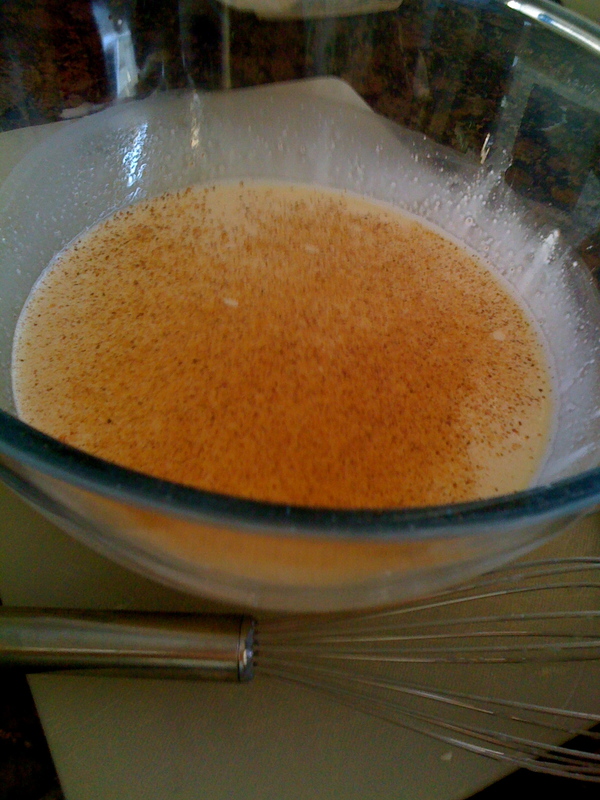 Whisk together eggs milk and cream, season with salt and nutmeg. finishing with the cheese sprinkled on top. 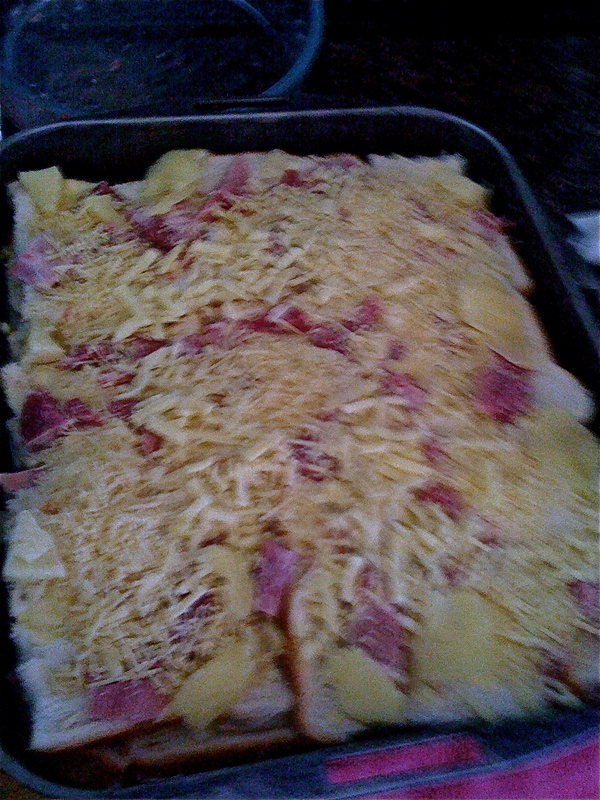 Bake in the oven for 25-30 mins until the top is beautifully browned. Turn off the oven, open the door, and leave the pudding in the oven to cool. I served this warm as directed and put the rest in the fridge to have for lunch cold. This serves 6 easily and was delish. When I said to the man that this is what I was making for dinner tonight he groaned as he does not like bread and butter pudding, but when it came out of the oven all he could say was "WOW"! I can't believe this little treasure has sat on my bookshelf all this time waiting patiently for Dom's challenge to inspire me to take it down. Think I might open Tess' book more often! This looks absolutely gorgeous! I am definitely giving it a go! Thanks for sharing the recipe!! My goodness Anne you got this hot off the press. Enjoy! I really like the sound of this - do you know I think I have only ever cooked once from the same book! I have looked through it several times though, think I had better get it out and look again. 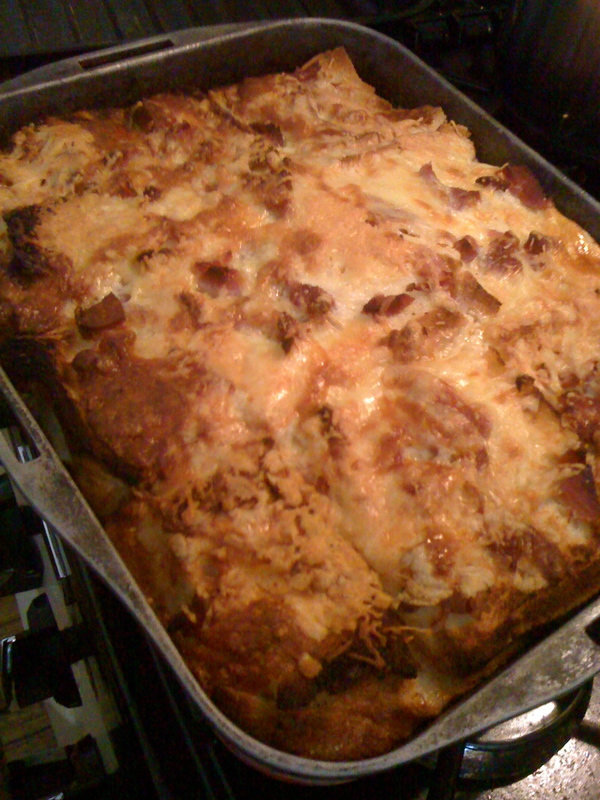 It looks really good and would make a really easy dinner prepared early and then eaten with a salad - yummy. Jen, don't believe you have this on your bookshelf too! Do have another look at this book I was so surprised by it. Looking forward to my cold leftovers tomorrow. Thank you - so glad I got all the bits right! I have had that cookbook in my cart for awhile now and really need to just order it! My guy's would inhale that meal. PS- thank's for the tag, I will try and write out my responds in the next few days. 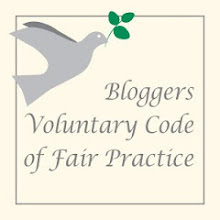 Tracey thank you for accepting the "tag challenge" I look forward to reading it. In the meantime I am sure this pudding would fill and hole in hungry tummies. Apples for Jam is one of my favourite cookery books but I have to say that like you I haven't many of the recipes from it before...I just love the little anecdotes and lovely images...but this looks amazing. Like your husband I'm not so keen on bread pudding but cheese makes all the difference. Deb, Welcome - it is a great recipe - give it a go! I came over from Dom's! This looks like perfect warming food! Welcome Shu Han so glad you popped over to have a look. This is a perfect winter warmer. Browse away - hope a few other things take your fancy. 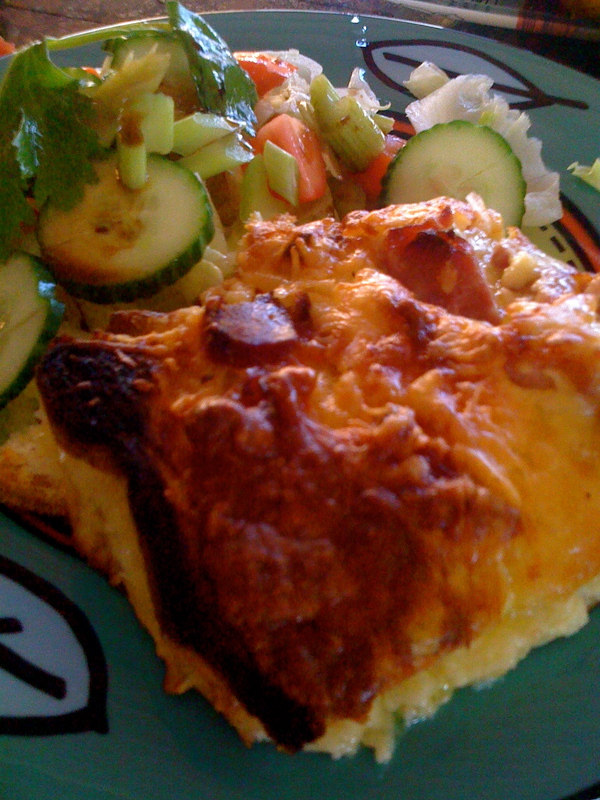 This looks a wonderful, comforting dish - I love the idea of a savoury bread & butter pudding. 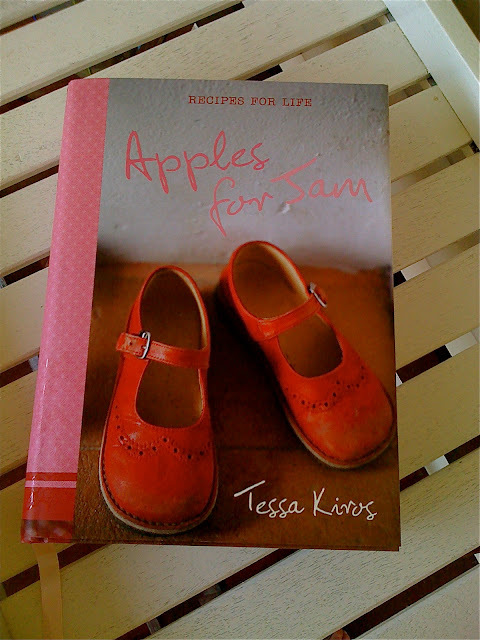 I have a couple of Tessa Kiros' other books (Food From Many Greek Kitchens and Falling Cloudberries) and really rate them, this has been a book I keep picking up and putting down in bookshops but I think it'll definitely go in the basket next time. Hi Suzanne - glad you liked the look of this dish - it certainly fills hungry tummies. I have also picked up and put down Tessa's books (although I do have PeriPeri Starfish) they look so lovely and the recipes very down to earth. Hope you stay and browse my site for some of her other recipes (I got a bit addicted)! Welcome and thanks for becoming a member, will certainly return the favour. Ruth, what a great find, I am sure you will find lots of delicious things inside. Thanks for commenting. I've also come over from Dom's blog - really glad this was your random recipe as it looks like yummy comfort food - like you, I nearly always have most of these ingredients in the house so will be trying this sometime soon. I don't know this cookbook, but will look out for it following everybody's positive comments. Thank you! So nice of you to pop by - hope to see you again. Welcome - and you have encouraged me to take this book down again and look for the honey cake you recommend. I have had a look at your blog and it looks very pretty with the rosemary flowers on top - lovely, its next on my cake list!